History has been made once again showing the level of illiteracy that governs the Nigerian state. The leader of the Indigenous People of Biafra, Mazi Nnamdi Kanu said it clearly that he will destroy Nigeria in their very own court and many were asking how he could achieve that whereas he is still in their custody; but the frivolous conditional terms that were attached to the bail granted him have totally exposed the level of judicial illiteracy in Nigeria thereby destroying the remnants of respect and reputation that the Nigerian government have in the face of international communities. 1. Submission of all international traveling documents. 2. Not granting any interview to the press. 3. Not to be found in a gathering of more than 10 people and never to participate in any rally, etc. How can a judge that passed through the four walls of an higher institution, obtained her MSc and other qualifications to lead her to the seat of justice grant someone bail based on health grounds yet denying such a person the freedom for treatment in any hospital of his choice, whereas Buhari who have committed different war crimes in the past and even till date by ordering the killing of peaceful IPOB protesters move freely to any country of his choice to treat his dying body without any restrictions or conditions even as he faults his own rule for flying abroad for medical treatment? Is that one justice? How on earth did you (Binta Nyako) think that a high profile personality and freedom fighter like Kanu will be set free after long incarceration by the Nigerian government will not address his people and the entire world for their unwavering support during his ordeal? Granting one bail but taking away his freedom of speech from such person which is his basic human right, is that one freedom? Having sat on your seat of justice, Binta Murtala Nyako, you ruled that Nnamdi Kanu should be granted bail on health conditions, how do you then deny him of sympathizers? Apart from sympathizers, the immediate family of Nnamdi Kanu is more than 10 persons, do you then mean that as a crowned Prince of Afara kingdom, he is restricted from even having a family meeting and/or addressing the people of his kingdom? The conditions of his bail is indeed mindboggling to be heard of by some, that a country certified to be issuing justice, one will not seize to wonder that if the judicial system is as corrupt and myopic as have seen from Justice Nyako, then sewage system would be cleaner and clearer to compare to the entire system. It is the time all learned and good people of the world especially from Nigeria to lend their individual voices to this case as injustice meted against one is an injustice against all because it will always be used as a reference point in your own turn or in the turn of your loved ones. The eyes of the world is strongly beamed on you, Binta Nyako and the script you are acting from your paymasters to see how you will crash at the end, you still have lots of time to retrace your steps and deliver justice without being partial as your actions continually unifies us more and even wins us more sympathizers on daily basis; as you saw in the person of the lion governor of Ekiti State, Ayodele Fayose and many more who are gearing up for the next court case. Have it at the back of your justice table that Biafra is a spirit and can never be silenced or defeated and Nnamdi Kanu is ordained to restore her back to her glory so it's important for you to have yourself a good name in the sands of history than making mockery of yourself which will, in turn, be used as a caricature by generation unborn. 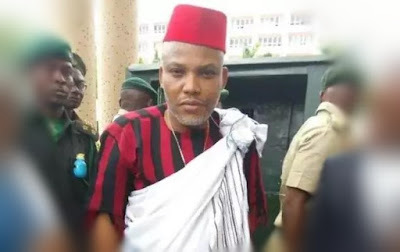 The Indigenous People of Biafra worldwide (IPOB) lead by Mazi Nnamdi Kanu is demanding that you must release our leader unconditionally having not found him guilty of any crime or offense that may warrant tagging some conditions to his release. It is time for all the world leaders to stand up against injustice in Nigeria and the entire Africa, following the footsteps of the Israeli Prime Minister, Benjamin Netanyahu to advocate peace for all parts of the world.